Your boat most likely will spend 3/4 of its lifetime sitting on its trailer. 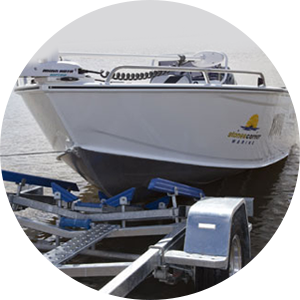 At CDN Marine Service, we understand that quality boat trailer repair service is important. Boat trailers face the toughest conditions. This includes submerging in fresh or half water repeatedly. Then the trailer is being stored for long periods of time exposed to the elements. As a result, boat trailers suffer from electrical problems, rust, and other issues. Are you looking for quality routine maintenance of your boat trailer? Perhaps you need boat trailer repair after an accident? If so, CD Marine Service will make sure your boat trailer is ready to go. We will get your boat back on the water in no time! Contact us today!